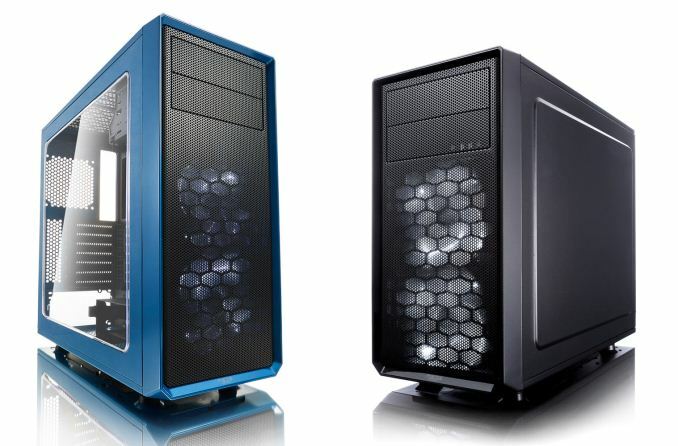 Fractal Design has just launched two new cases under the banner of the new Focus G series. The Focus G is a standard ATX mid-tower, while the Focus G Mini features a more compact footprint and is intended for Micro-ATX and Mini-ITX builds. While both models will be offered in black, the larger Focus G will also be offered in white and a brand new choice of Gunmetal Gray, Mystic Red, and Petrol Blue. This multiple color option is a first for Fractal Design. The Focus G series is manufactured using a combination of steel and plastic as you would expect from a cost-conscious case series. What you wouldn't necessarily expect in 2017 are the two external 5.25” drive bays. Size and color differences aside, these two models are effectively twins and they share numerous key features. Both cases have a large side panel window, removeable and vibration dampened storage drive bays, 18mm to 25mm of cable routing room behind the motherboard tray, and a front I/O panel that includes one USB 3.0 port, USB 2.0 port, and two audio jacks. When it comes to fans, both models have a total of six 120mm fan mounts, four of which can also hold 140mm fans (three on the Focus G Mini). There are removable dust filters everywhere but the rear. Fractal Design has included two front-mounted Silent Series LL 120mm LED fans that glow white light through the front mesh. Internal 2 × 2.5" or 3.5" and 1 × 2.5" 2 × 2.5" or 3.5" and 1 × 2.5"
These Focus G series models also have extensive liquid cooling support, with radiator mounts in the front, rear, and the top of the cases. Those more interested in air cooling will be able to fit heatsinks that are up to 165mm tall, which means just about every cooler on the market. Both models can also handle graphics cards up to 380mm long, while power supply depth is a very spacious 230mm. The other similarity is that both models are going to retail for $49.99 USD, which places them firmly in the competitive budget case market. We have no word on availability, but sometime after Computex is a firm bet.